To immerse yourself in a completely relaxing atmosphere while discovering idyllic country villages with strong gastronomic traditions, all you have to do is book our tour of the Bandiera Arancione Villages of the Ligurian Riviera. 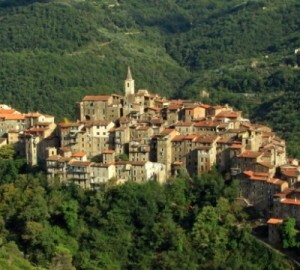 A land of genuine traditions, the Riviera of Ponente opens its doors to take you on a journey of discovery of its treasures: the fascinating villages that have been awarded the prestigious Bandiera Arancione (Orange Flag) by the Touring Club Italiano like Dolceacqua, Apricale, Triora and la Pigna. Afternoon arrival with check-in to selected hotel. After a dinner at the hotel restaurant, you’ll be free to test your luck in the gaming halls of the Casino Municipale of San Remo. Return to hotel and overnight stay. In the morning, transfer to Triora, the… witches’ town! No, it is not a legend, but documented history, as you will find out while visiting the Museo etnografico e della stregoneria, where you will find yourself in 4 sombre rooms which preserve the memory of a tragic chapter in local history. In 1558, in fact, the trial was held of a group of thirteen women who were considered responsible for the famine that had plagued the region the previous year. The trial ended with their tragic condemnation to the stake for witchcraft. After the museum visit you’ll be able to explore this charming medieval town in the Ligurian Alps and have lunch in a local restaurant, tasting some typical local dishes of. In the afternoon, return to the coast and visit to the old town of Taggia, where you can linger in the splendor of its characteristic streets and archways, then on to the convent of San Domenico and the prestigious art gallery, before heading into the area of the local shops where you will have the opportunity to purchase the typical canestrelli and anicini biscuits of Taggia. In the morning, transfer to Dolceacqua, pearl of the Valle Nervia, and one of the first villages to earn the bandiera arancione. Dolceacqua is a delightful medieval town, featuring an ancient humpbacked bridge and the ruins of the castle of the Doria. Here, among artisan shops you can discover the true nectar of the Riviera: the Rossese di Dolceacqua, a prized red wine with an intense flavor. At lunchtime you can enjoy the full range of wines of the Riviera, accompanied by delicious specialties of the valley. In the afternoon visit to the old medieval village of Apricale, with its narrow streets clinging to the alpine slopes, where in season you will have the opportunity to taste a typical Ligurian snack: pansarole con zabaglione. Return to your hotel, dinner and overnight stay. In the morning, a visit to the pristine historic center of San Remo: la Pigna. Dear to Italo Calvino, who used it as the setting for his novel “Il Sentiero dei Nidi di Ragno”, la Pigna even today retains much of the feel of an authentic medieval quarter and affords the more inquisitive visitor the chance to find a hidden San Remo, a city of winding stairs and twisting alleyways, of archways and secluded, serene little squares. At the very top is the Sanctuary of the Madonna della Costa, protector of seafarers, which towers above the city, offering a spectacular panoramic view. You are free for lunch. Return to the point of origin follows. Round trip travel, local transportation and anything that is not included under the entry “our offer includes”. Lunches and dinners are to be chosen according to the menu of the day or the tasting menu proposed by the chef. Beverages and à la carte items are to be paid for on site.